Upcoming missions to remote destinations like Jupiter’s moon Europa will operate at extreme distances from the Earth. The high-radiation environment limits their expected lifetimes, so they must make the most of every observing opportunity. We have developed methods to analyze data as it is collected during a Europa flyby to quickly identify content of interest: an active icy plume, surface mineral deposits, or any unexpected phenomena (scientific anomalies). Data with positive detections can be marked for high-priority downlink to Earth and inform the next steps in mission planning. In addition, for operations on the Europa surface, we are developing vision-based methods to strategically select candidate locations for sampling with a robotic arm. This talk discusses data analysis and machine learning methods that can operate onboard and increase the rate of exploration and discovery. Dr. Kiri L. Wagstaff is a principal researcher in artificial intelligence and machine learning at the Jet Propulsion Laboratory. 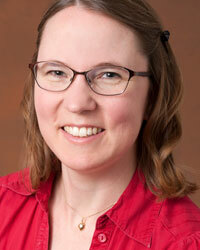 Her research focuses on developing new machine learning and data analysis methods for spacecraft. She holds a Ph.D. in Computer Science from Cornell University, an M.S. in Geological Sciences from the University of Southern California, and an MLIS from San Jose State University. She received a 2008 Lew Allen Award for Excellence in Research for work on the sensitivity of machine learning methods to high-radiation space environments and a 2012 NASA Exceptional Technology Achievement award for work on transient detection methods in radio astronomy data. She is passionate about keeping machine learning relevant to real-world problems.